Receive up to S$80 gift vouchers when you meet a min. spend of S$500 within the first month from card approval date. 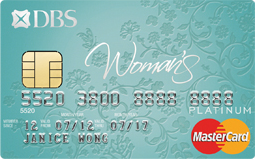 The DBS Woman's World Mastercard is the standard version of the two Woman's cards offered by DBS. The card gives 5 DBS points for every $5 spent when you shop online. (We estimate 10 DBS points to be worth around 15cents, which adds up to an equivalent of 1.5% "cash-back" on your online shopping) Take note that for online shopping, after the first $1000 spend a month, reward point earnings drop to 1X. Points aside, this card gives ladies 2 complimentary visits to selected true fitness centers every month + other benefits if you decide to join as a member. The bottom line: A great card for online shoppers who don't mind tracking and redeeming credit card points. The 1.5% reward value is decent, and we like the complimentary access to true fitness centres.